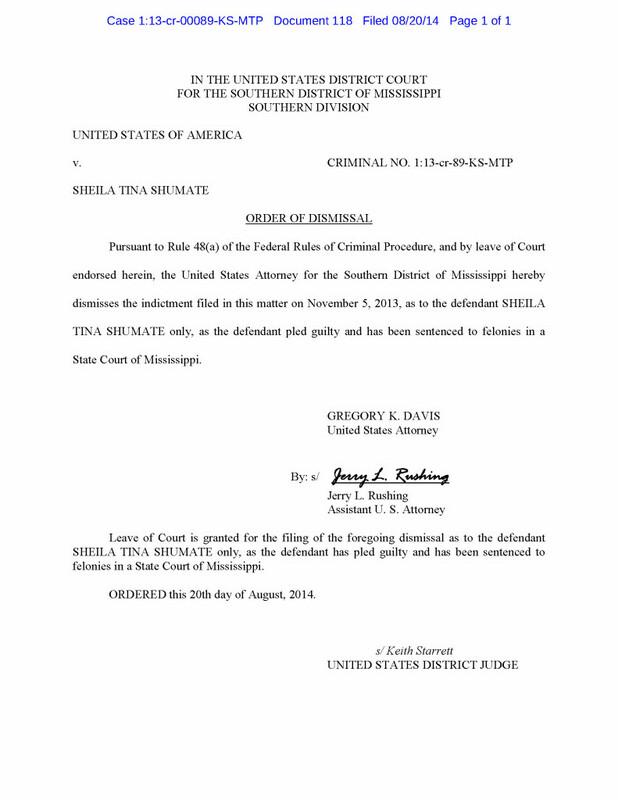 Slabbed has learned that Tima Shumate, former head of the Mississippi DMR CIAP program, has been released from MDOC custody. Stay tuned to this developing story. I’d like to take the opportunity to dispel two rumors as Eye Spy took the opportunity to help me out with some links and background plus I spoke with a couple of other folks that will remain nameless. 1. There is no truth to the speculation that Ms. Shumate’s release is in any way related to the Livingston Parish CIAP Investigation. 2. Ms. Shumate’s release was not politically motivated. Our state prisons are stuffed full of nonviolent offenders. In 2013 a law was passed that reduced the amount of time nonviolent offenders had to serve to 25% of the total sentence so that we could house more violent offenders. Shumate, based on when she took her plea, fell under the new law. If someone deserves the blame for this state of affairs it would be her lawyer Tim Holleman, who would be on the short list of people I’d go see if I got into serious criminal trouble. The bottom line is Ms. Shumate is being treated no differently than others similarly situated. More Mississippi Mud? Louisiana Mud too? Flipping swamplands and CIAP funds? FBI has been asking questions? Say it ain’t so. Oh, and that name seems strangely familiar. “Federal authorities have been looking into Madison County Tax Assessor Gerald Barber and his role in a Louisiana land deal that scored almost $3 million in profits for private citizens and a conservation group. 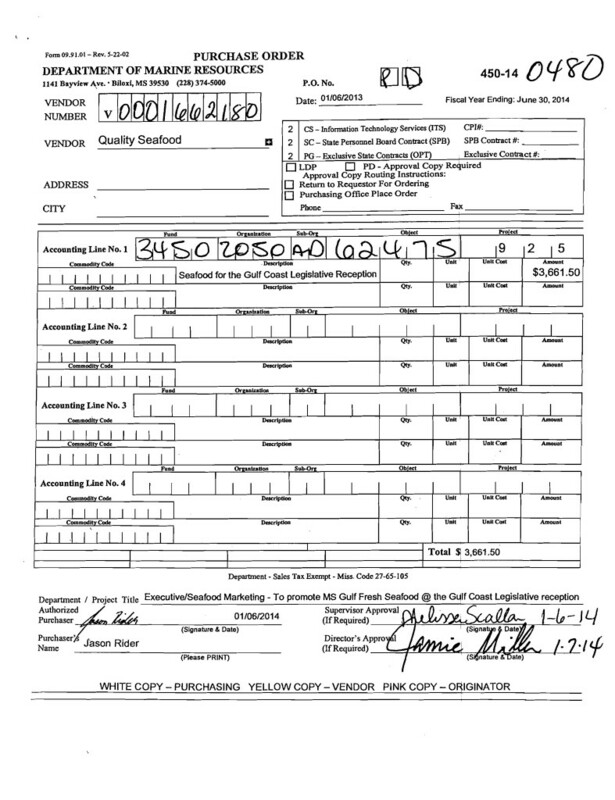 The lynchpin for the deal may have been an apparent inflated appraisal done by Barber’s firm, Barber & Mann Inc., that the U.S. inspector general called “noncompliant” and unreasonably priced in an audit. DMR Scandal day 53: The bucks are beginning to stop. It’s Miller time so let them eat shrimp! This is the defense side of things per Anita Lee’s DMR employee’s South Mississippi home searched circa January 2013. The DMR paid $245,000 for the lot on a bayou near the Pascagoula River. Holleman said Shumate removed herself completely from the land transaction. He said her parents, Curt and Ann Hebert, saw the program advertised and approached the DMR about buying the property. More precisely one thought on the information contained in Anita Lee’s story on same. Shumate allegedly approached the Land Trust for the Mississippi Coastal Plain about buying the property. The Land Trust and Scott Walker signed a sales contract in April 2011. Shumate’s attorney, Tim Holleman of Gulfport, who attended the plea hearing, said afterward that Shumate maintains her innocence. He noted that the government alleges Bill Walker “directed” her to approach the Land Trust, not that she conspired with the Walkers. But she is included in the conspiracy charge with the Walkers. I seem to remember that a conspiracy could involve other acts. Shumate’s purchase of her parent’s property with Coastal Impact funds could be one such possible act the prosecutors would use. The Good Book appears to back this understanding. It will be interesting to see if Shumate and Ziegler cave or take this into a courtroom. Both have top notch legal representation. There really is a method to the madness…. And from the whistleblower retaliation files Sheriff Gusman remains stuck on stupid….. Author Douglas HandshoePosted on November 1, 2013 March 13, 2014 Categories SopTags Calvin "Calhoun" Fayard, Coastal Impact Assistance Program (CIAP) CIAP, DMR Friends and Family Scandal, East Jefferson General Hospital, Jefferson Parish Council, Mississippi State Auditor Stacey Pickering, Orleans Parish Sheriff Marlin Gusman, Public Access to Public Records, Transparency, West Jefferson Medical Center32 Comments on There really is a method to the madness…. Vital background via Anita Lee can be found here. The land deal closed 12 days before Scott Walker’s final, lump-sum payment was due on a loan at Merchants & Marine Bank, Jackson County land records show. Walker had used the property in July 2008 as collateral on a $310,590 loan, which called for monthly payments of $2,775. The balance and all interest payments were due July 25, 2011, although the terms did allow for loan extension or modification. Tattoo? I heard that word most from investment bankers doing M&A work a decade or so ago. Tatoos are not easily removed, especially those given a bank by a family member to induce the extension of credit to someone that is not otherwise creditworthy enough on their own to nab a $310,590 loan. Auditor Pickering had to get out in front of the rampant rumor mill and boy did he! So what do we know now? Here are a few observations. The FBI was poking around before Michaela Hill’s tragic suicide and indeed they interviewed her.